Tiree is definitely on our list of places to revisit. 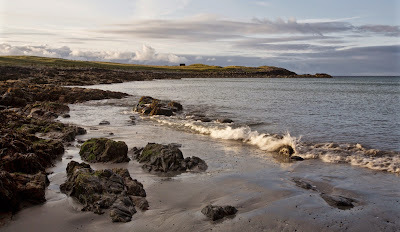 The ferry timetable meant that we could have only a very brief overnight stay, arriving in the early evening and departing early the following morning. The island's ranger (who meets the ferry and whose office is on the quayside) was very helpful with suggesting suitable spots for wild camping. We had emailed ahead, so he was expecting us, but we had to join the queue of new arrivals in camper vans wanting his guidance on where they could park. Tiree had such a friendly air, perceptible as soon as we rolled off the ferry. Lots of locals were there meeting friends, family and guests from the boat. Our trailer and trailer bike outfit drew a few glances, and kind enquiries. 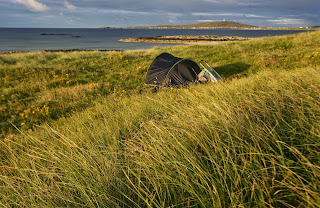 We cycled a couple of miles from the quay and pitched our little tent in the dunes overlooking the beautiful beach at Crossapoll, on the ranger's recommendation. We passed a lovely clean public convenience block where we were able to obtain drinking water on our way there. The machair gave us a few difficulties as we pitched the tent- it was so soft that the tent pegs were spinning round, and the tent was essentially unanchored. With a stiff wind, we were forced to use the trailer as a wind break and to weight the back of the tent down with anything we could think of. We decided to cable tie the inner to the fly sheet in the hope that it might increase the chances of still having the fly sheet in the morning. We lost at least two pegs in the battle to get pitched, and since we only had a couple of spares, that was a fairly high rate of attrition! None of us minded the early morning start. We were just sorry to leave so soon.